The son of Vincent van Gogh's mailman investigates his death by interviewing the people who knew Vincent when he was alive. We love animated movies, so we were excited to see "Loving Vincent" since it looked like one of the most visually compelling films to be released in 2017. It is directed by Dorota Kobiela and Hugh Welchman, who also wrote the screenplay along with Jacek Denhel. It takes place just after Vincent van Gogh's suicide. His mailman and friend Joseph Roulin (Chris O'Dowd) asks his son Armand (Douglas Booth) to deliver the last letter van Gogh ever wrote. Once Armand arrives in van Gogh's community, he begins talking to the locals and thinks there is more to Vincent's death than what was previously thought. The movie also stars Saoirse Ronan, John Sessions, Aidan Turner, and Helen McCrory, to name a few others. 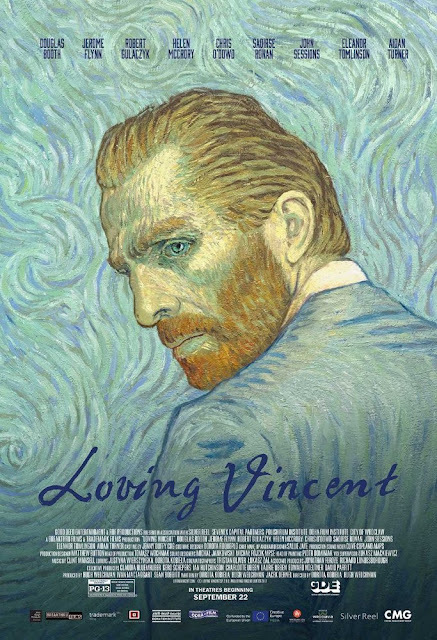 The major selling point of "Loving Vincent" is the technique used to animate it. It was handpainted on canvas by over 100 artists in the style of van Gogh's work. That selling point is by far the film's best feature. Of course, most animated movies prior to 1990 were hand-painted or hand-drawn by artists on animation cells rather than canvas. Here, rotoscoping is used to make the actors look more lifelike, an old technique that Ralph Bakshi was very fond of implementing in his animated works. Still, it does create a visually interesting effect. It really captures the aesthetic of van Gogh's work as it attempts to bring his painting technique life. Unfortunately, that is really the only interesting feature about this movie. We are sorry to say we found the story itself to be a complete bore. There is not one interesting thing about the narrative that's even remotely compelling. We never felt truly connected or drawn to what we were watching. We would have much rather watched a film that explored van Gogh's life as opposed to one that spent so much time focusing on a conspiracy theory about his death. Characters walk and sit around spinning their wheels and trading banal dialogue for an hour and a half. By the end of it, they (and we) are no better off than when they started their journey. As the movie came to a close, we felt like we didn't know much more about van Gogh or his art than we did when the film started. Everything else (story, characters, dialogue) seems secondary to its gorgeous visuals. "Loving Vincent" is a good movie to watch if you want to see Vincent van Gogh's work come to life as an animated film on canvas. It really is a visual delight. If it's an emotional impact you're after, you may be better off looking at one of van Gogh's actual paintings instead.